Pastor Appreciation Month – May We Help You Convey Thanks? Any time of the year is a good time to convey thanks to your pastor or priest – or anyone involved with ministry. But since October has been set aside as Pastor Appreciation Month, many congregations (and individuals, too) like to do a little something during that month. 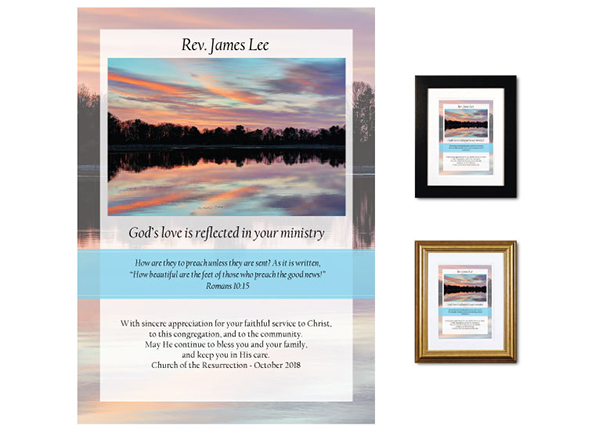 If you’re looking for a little something tangible to present to members of the ministry team, check out our collection of pastor appreciation plaques. Whichever design you select, you’ll be able to personalize it especially for the recipient. Each piece is created using archival inks and paper, along with museum quality matboard. They’ll look just as good years from now as the day they’re presented. We are very busy this time of year; make sure to get your orders in soon!